Bloom! What did you plant? 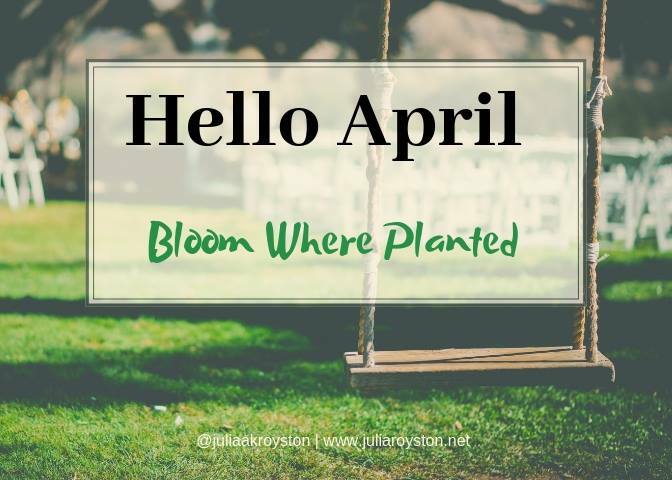 Hello April and I must first make a confession. I do not have a green thumb at all. My father always planted beautiful flowers in the back yard. My father in law raised and grew rare roses for years and has a garden which we eat from for months after the harvest season. My husband has fish, can grow plants from seeds but I didn’t get that gift. Maybe I just don’t have the desire or the patience for gardening. I love flowers and the results of other people’s hard work but don’t do it myself. I realized though that I plant other things. I plant stories into the lives of people around the world. I plant books into the hands of first time authors that have dreamed of writing all of their lives. I plant music into the ears of many so that they will be blessed, inspired and moved to be encouraged by the words. I plant businesses into the minds of people who never thought about owning a business before. You may not see my handiwork in the gardens, backyards or potted soil in and/or around a house but the results of the seeds of wisdom, encourage, skills, tools and strategies are producing a great harvest each and every day. So my question to you is what did you plant? Is it the seeds of discord to discourage and divide or the seeds of unity to find more ways that people are alike rather than different. Did you sow the seeds of information and/or resources for this and the next generation to thrive and grow long after you have passed off the scene of this life into the next? What did you plant? What are you about to plant? It’s planting time. In the fall, we’ll all be looking and expecting a harvest. What are you going to plant? Bloom where you are planted. Sow seeds of love.